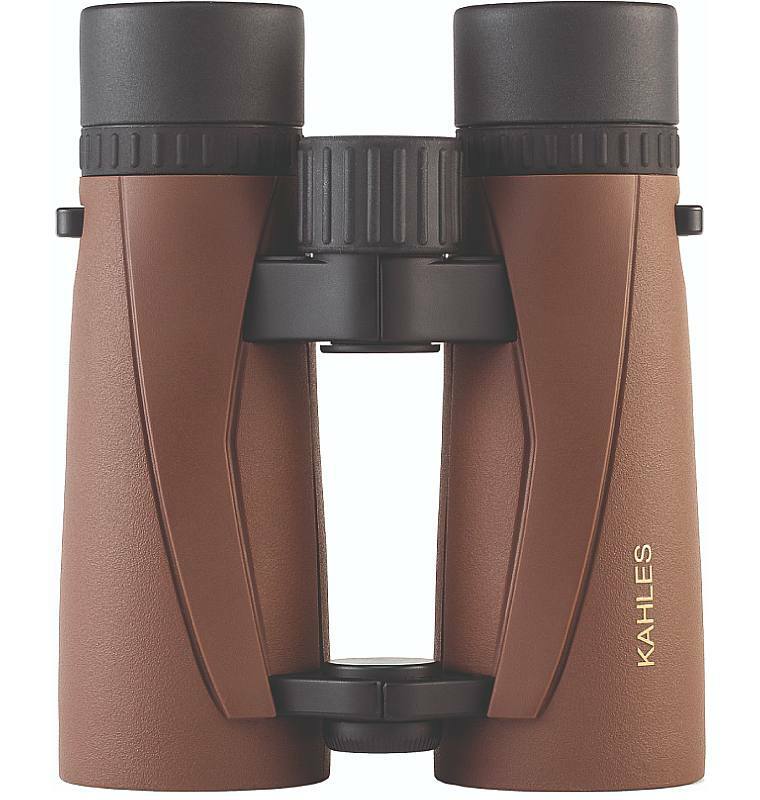 One standout feature of the whole series of Kahles Helia binoculars is their really distinctive brown color. To me this immediately advertises their intent to be a little different from the norm and stand out from the crowd. But at the same time it still remains functional as in almost all arenas where these are to be used this brown coloration is going to be good for camouflage. With this design of two thin bridges connecting the barrels at either ends and leaving the central area open, you have a lot of surface area with which to hold onto the binocular. You can also wrap your hand right around a barrel for a really secure grip when carrying your instrument in one hand. In theory this open bridge design can also make for a more lightweight bino as less material is used in their construction, but in reality this is not always the case. Weighing in at 750g (26.5oz), these are about average for a high end 42mm binocular. Likewise in regards to their outer dimensions as they are neither especially compact or large for a bin in this size class. The IPD range on these Kahles Helia 8x42 Binoculars is advertised as 5.6cm -7.3cm, which as you can see in this guide to Interpupillary Distance & Binoculars is also fairly standard and thus will accommodate the needs of most users. 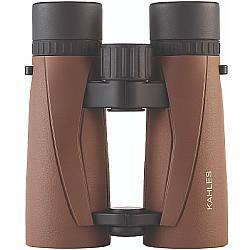 The Kahles Helia binoculars are completely sealed and they are rated to a depth of 1 meter in water., which also prevents dust from being able to enter. Inside the body, the air has also been replaced with a moistureless Nitrogen gas, this prevents the internal lenses from fogging up. With the use of a tripod adapter, these can be quickly and easily attached to a tripod. This is often an important consideration to hunters in particular. I have to say that Kahles are pretty coy when it comes to revealing exactly what glass and coatings are used in most of their instruments. For me this is a little frustrating and in my opinion they are doing themselves no favours as I am quite confident what they do have is impressive and should be used to highlight the quality of the product. What I can say for sure is that they use Schmidt-Pechan roof prisms made from BaK4 which is exactly what we want to see. Also great to see is that the exterior lenses on the Kahles Helia 8x42 Binoculars are treated with an "oil-phobic" material. As well as oil, this will prevent fingerprints and dirt from easily marking the lenses. It also makes the lenses easier to clean as you have to apply less pressure, which in turn reduces the risk of you permanently marking or scratching them. This is not quite wide enough for me to add it to my page of very wide angle binoculars, but will still be more than adequate for most users and uses. At 2.1m (6.9ft), the minimum focus distance on these is pretty good for an 8x42 binocular and this these do make good choice should you also like to view insects, flowers or even birds from close range. The 20mm of eye-relief is excellent and along with the twist-up eye-cups will make these a good choice for eye-glass users. 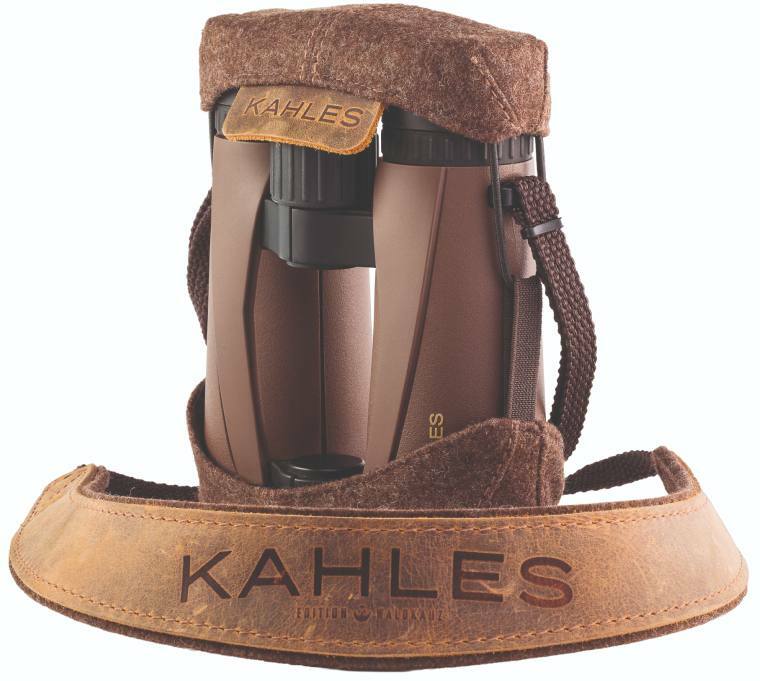 Hand-made from real leather, wool and felt, One of the real highlights of the Kahles Helia binoculars is their unique and dare I say it, stunning looking hand made neck-strap and protective binocular cover. Produced for Kahles by the renowned Waldkauz® company that have become famous for their hunting clothes, backpacks, bags, weapon accessories and binocular accessories, they really do add a tough of class to the Helia. The cover in particular is interesting in that it does provide less protection than a good quality carry case, but it not only makes accessing your binocular quicker, but it also completely silent as there are no Velcro straps or Zips to worry about. For the hunter this is of particular importance, but there are many wildlife observers and birdwatchers that will also appreciate this feature. Open table in full screen mode to view the full results. As I mentioned in the opening paragraph, the Kahles Helia 8x42 binoculars look to me to be a really good all-rounder and far more than simply a hunting binocular. Whilst not cheap, they cost considerably less than other 'alpha' type binoculars from Austria and Germany. However as they do not divulge the exact level of optics used, it is hard for me to say if they are equal in all departments. My best guess is that they probably get close, perform well above the majority of instruments, but do not quite match the very, very best binoculars. But then again, they do cost less than these and you get a stunning looking instrument from a very high quality European brand with a long history and tradition in making some of the very best optics.